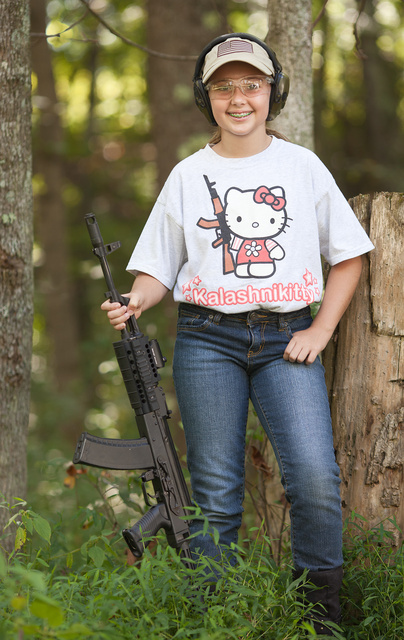 Ten year old Ayn is too small to fire this rifle off-hand, but she can handle it supported. On her visit from California, she mostly shot suppressed .22s, but she just had to pose with an AK…after all, it matched her shirt! The rifle is a Romanian AK74 with Midwest Industries forend and Primary Arms red dot sight. What I want to know is where could I get that shirt in size XL? This entry was posted in interesting people, rifle and tagged 5.45mm, AK75, girl, Kalashnikitty, red dot, tshirt. Bookmark the permalink. 17 Responses to Steady does it. Thank you Oleg! We all had a super time, very special trip for all of us. Kevin Baker regularly posts when Erik is about to do a run. Erik’s email is also in the link. Get yourself a shirt, you’d look awesome in it! Where can I get kalashnikitty shirts? Very cool! They won’t lock her parents up for her wearing that shirt in California? And take her away from them? “These pictures are present what you can do with orthodoxly AK when you have imagination, patience and old good rasp-file”. Kalashnakitty. *lol* I love it! The maker of that shirt does production runs 2-3 times a year. Christmas is coming, so there will be a run soon. I advertise for him on my blog when this happens. Just come over and search for “Kalashnikitty” to find the most recent posts. Hey there, Oleg – yes, I am doing another run of shirts starting next week – will take orders for a month and then have them produced and shipped out by Thanksgiving. Tons of styles, colors, camo versions, long sleeve, short sleeve, sweatshirts, even Hoodies. Email me at erickelly1@verizon.net for details – thanks! Those shirts are pretty cool.She looks like she had alot of fun. My daughter and I love our Kalishnikitty t-shirts, hers little, and in pink, mine big, and in black. Eric even came up with an XXLT since I’m a freak and need a tall size so that I don’t look like I’m wearing my little brother’s shirt. I was also impressed with the quality of the t-shirts used. My daughter and I wear them at the same time and people just crack up.